Grilling season is upon us! And what better way to make use of your outdoor cooking space than homemade sausage! Making chicken sausage is fun and easy, and a great way to utilize home-raised chickens that might be a little on the tough side. In my post Tough Meat, Tough Decisions, Intro to Homemade Chicken Sausage, I talk about how this recipe was created out of need. The need to make good use of a freezer full of old, tough roosters. And while this is a great way to create succulent, juicy sausage from tough old birds, it would also be delicious if made with store-bought meat. So give it a try, it’s sure to get your grilling neighbors peeking over the fence. 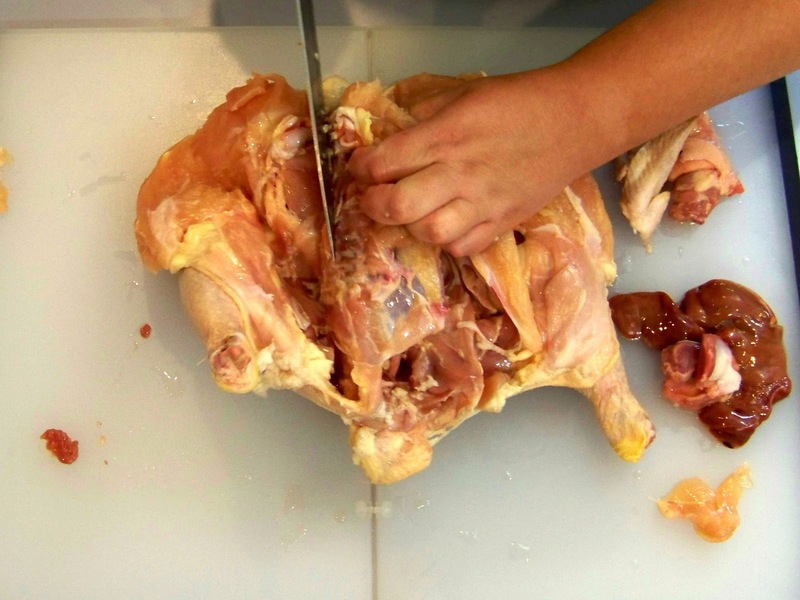 The first step in creating chicken sausage, is de-boning the chicken. Even when buying store-bought meat, I prefer to purchase whole chickens. It’s less expensive per pound because you’re not paying for someone else to cut it up for you. 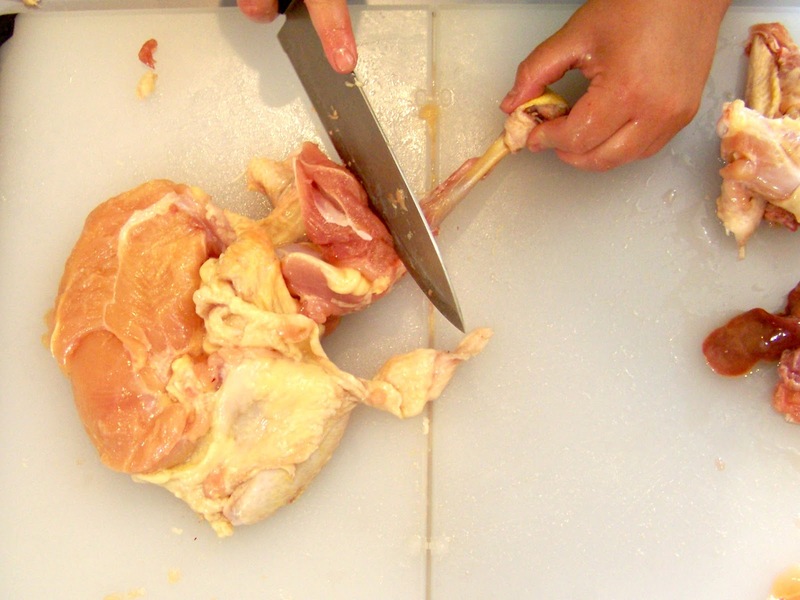 I like to cut it up myself, because I have more control over the sections of meat. 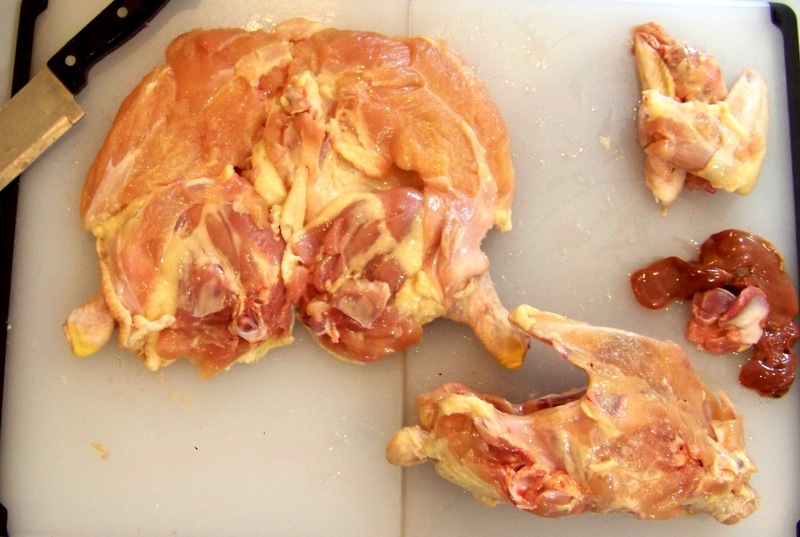 I also make good use of the bones, skin and organ meat by making homemade stock or fried chicken livers. If you do decide to purchase de-boned chicken, like boneless skinless breasts, I advise adding a package of chicken thighs. I think of sausage as being sort of rustic, and kind of outdoorsy; the dark meat gives the sausage a great, rich flavor and a little extra fat for juiciness. 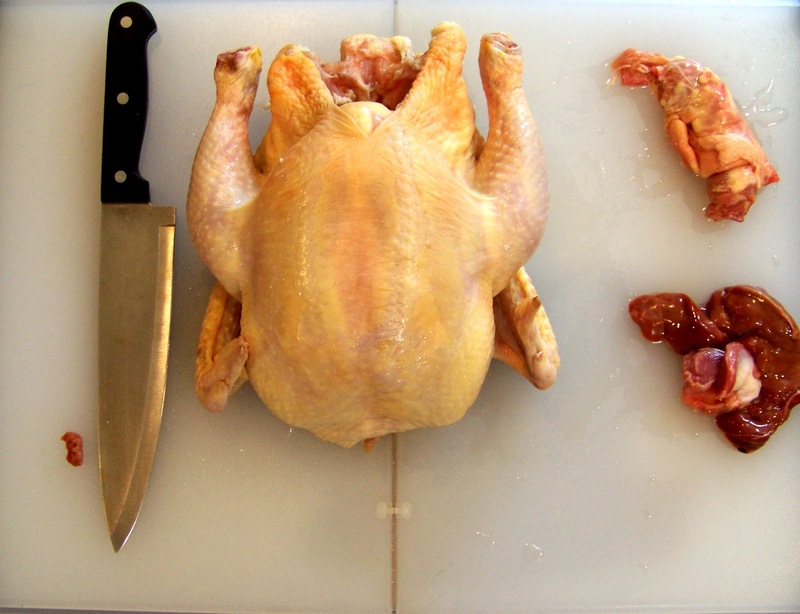 This technique for de-boning a chicken is nothing fancy, I am by no means a skilled butcher, but it gets the job done. 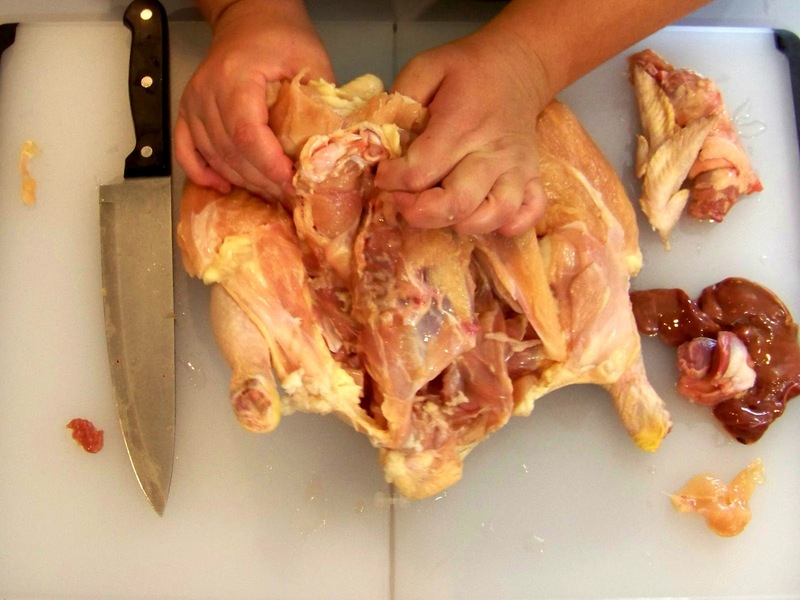 Butchering chicken in this way gets you a large boneless piece of meat which can be useful for many dishes. It can be pounded and rolled for something like Chicken Kiev, or stuffed with a delicious wild rice dressing. But for chicken sausage, don’t worry if your meat doesn’t come off all in one piece. When making sausage, it doesn’t really matter how the meat leaves the bones because it’s all going to get ground up anyway. Continue cutting down the spine and around the cavity, keeping the knife slightly angled away from the ribs, but as close to the bones as you can get. Carefully use your fingers to pull away the meat as you work down. 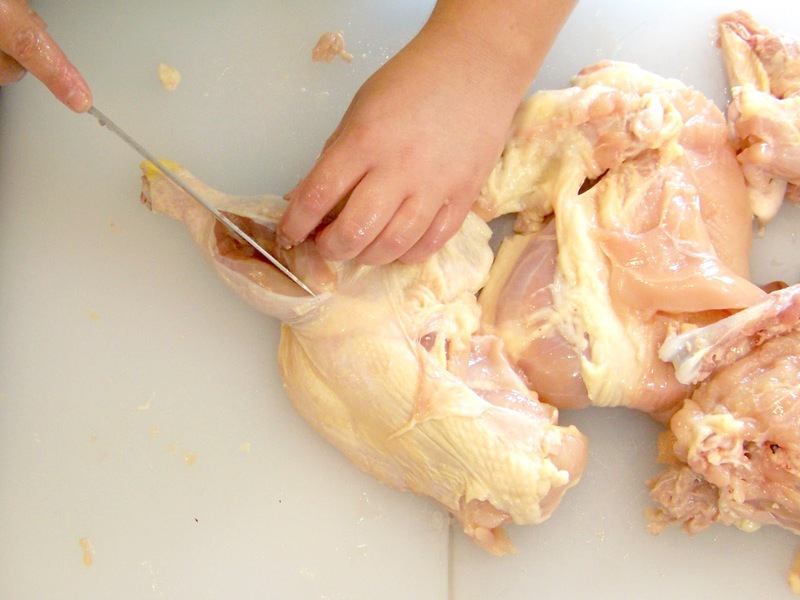 There is a delicate “V”-shaped bone toward the rear of the chicken. 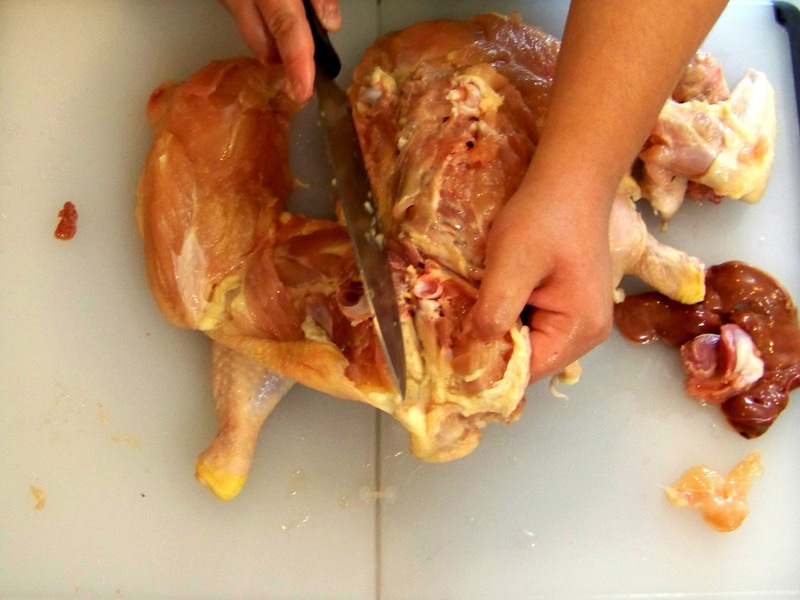 Be sure to go on the outside of this bone, and slice until you reach the thigh and wing joint. 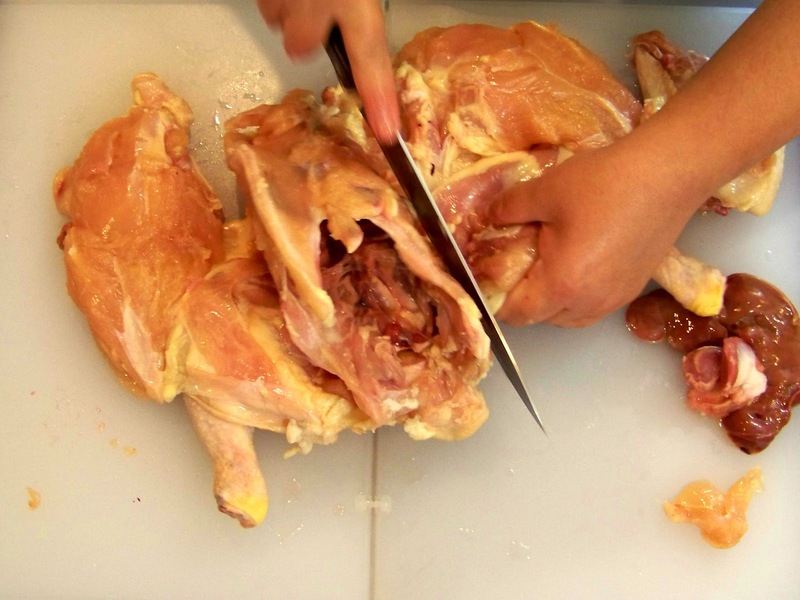 … slicing down to the joints. 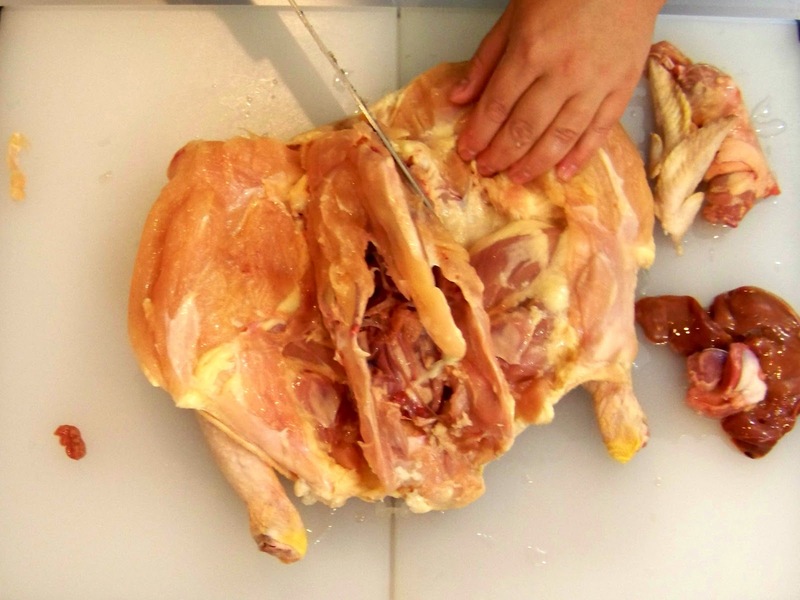 To remove the wing from the cavity, slice the meat to the joint. 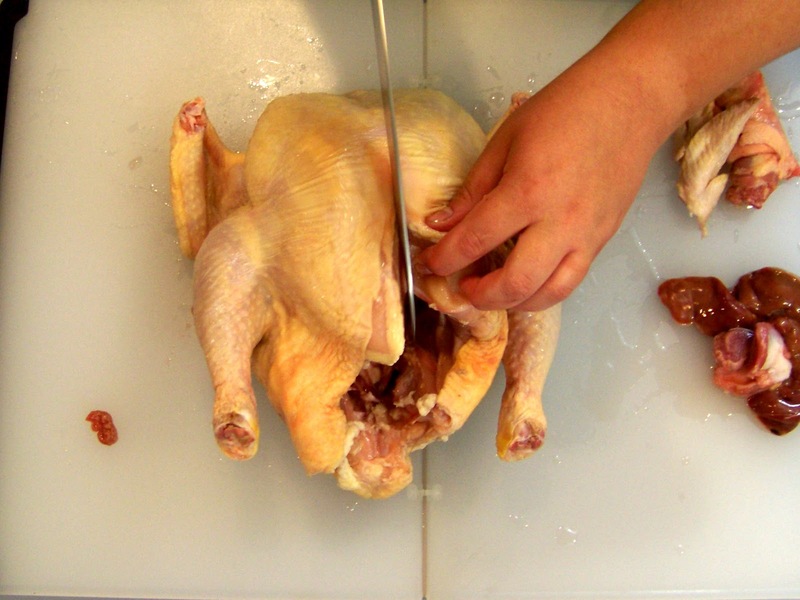 Then, take the joint and “pop” it, by bending the wing down toward the cutting board. You will then be able to slide your knife past the joint, keeping close to the cavity. Repeat for the other wing. … and around the cavity. 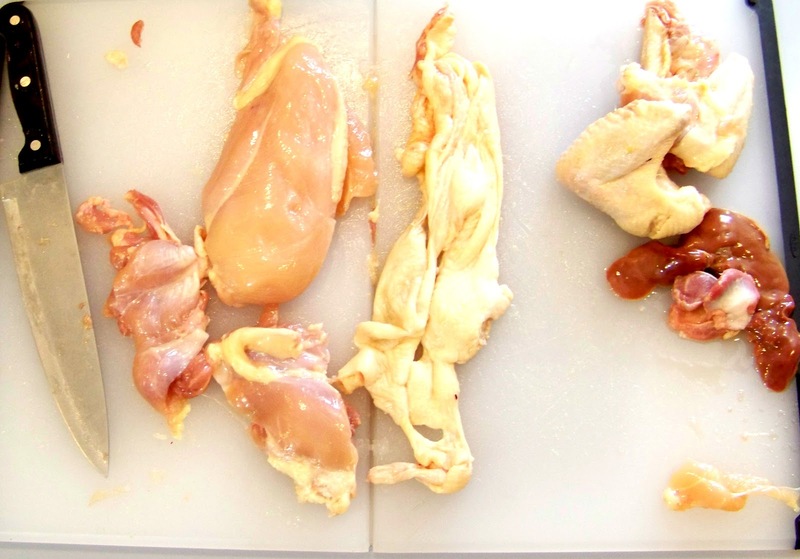 You now have the meat removed from the cavity (cavity shown in the lower right-hand corner of the photo). You could stuff the chicken at this point. 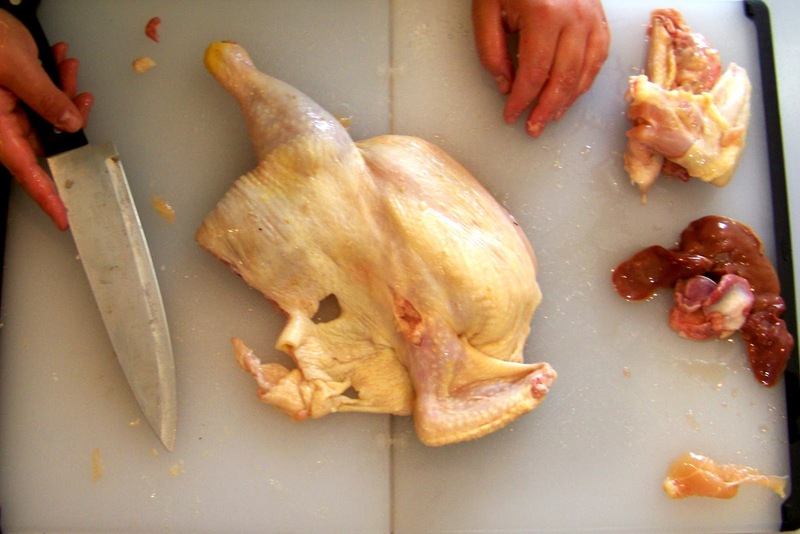 Or remove the wings and legs and pound the meat flat for a rolled chicken dish. 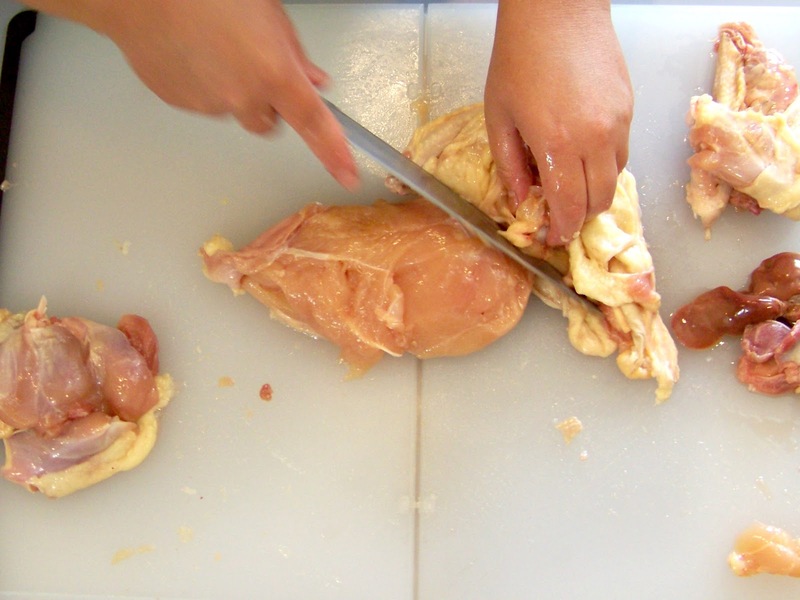 Here I cut the chicken in half so we can see the wing, thigh and legs clearly. We also want that dark meat to flavor the sausage. To remove the meat from the thigh bone, flip the meat over, skin side down, and find the tip of the bone that we removed from the cavity. 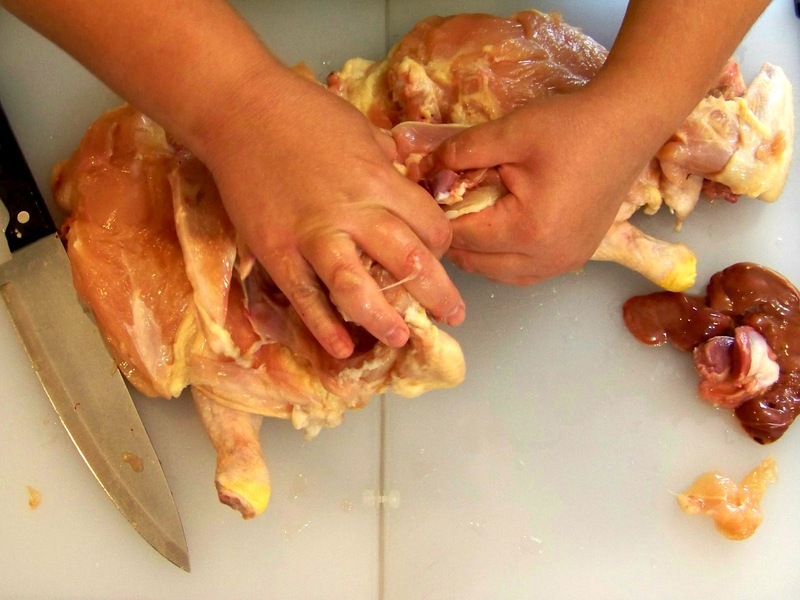 Pull the bone away from the meat with your fingers. With a bit of assistance from the knife, the meat should slide off fairly easily. When you get to the leg joint, “pop” it and continue slicing. 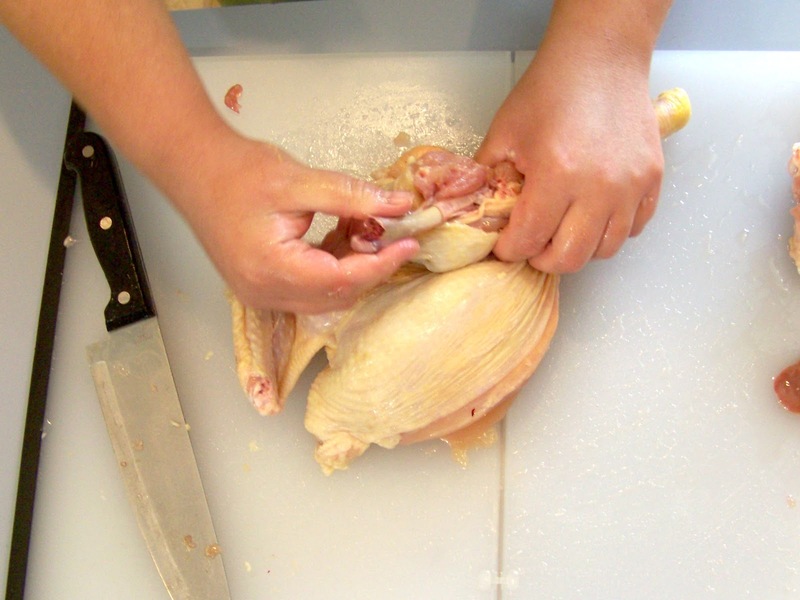 … and remove the bone in the same manner as the thigh. Use the knife for any tough spots. Be careful, as there is a delicate bone that runs along the leg. Set your meat aside and weigh it. You will need approximately 4 pounds of chicken for our sausage recipe. (I include the organ meat in this weight, because I grind it into the sausage also.) Depending on the size of the chicken, this could be anywhere from 2 to 4 birds. Our roosters had hardly any breast meat, but really large legs. The recipe can be easily halved, doubled, tripled, etc. depending on your needs. But after you taste it, you’re going to want more. Oh, I’m so glad you are enjoying the posts! It’s really fun and the possibilities are endless. I’m trying a breakfast sausage this week with maple sugar. Can’t wait to see how it turns out! I’m looking forward to this! My family is getting sick of chicken already and we don’t even have our meat birds yet, so something new (like sausage) would be really welcomed!